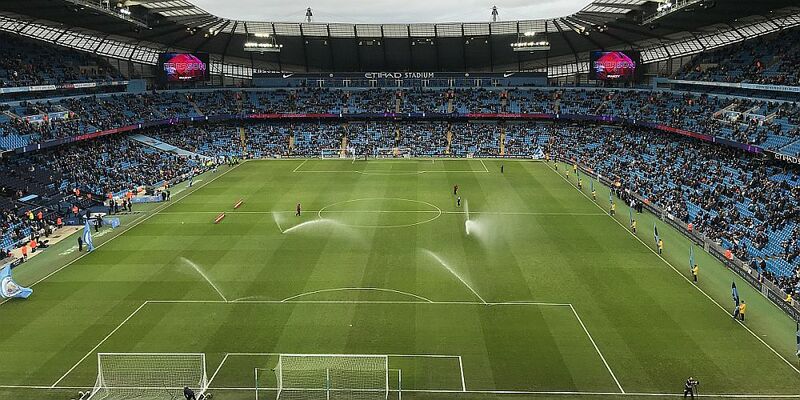 A delayed bus journey to Manchester, anti-Brexit demonstrations, packed trams, a drenching and a long delayed bus trip home all added to a 5-0 FA Cup defeat at Manchester City just about confirmed yesterday was some way short of being the perfect day. It was the biggest defeat I’ve seen us suffer in the FA Cup, equalling the sixth round replay against Sheffield Wednesday at Hillsborough 36 years ago, and, in truth, I don’t think we really could have ever considered ourselves favourites yesterday although I think we were probably hoping not to suffer a repeat of the 5-0 defeat there in the league as recent as October. I seem to be using the X43 bus service into Manchester quite often this season for away games. It’s usually to get to Piccadilly for a train but yesterday we jumped off on Deansgate and went for a drink and something to eat before making our way to the Etihad. That was probably the best part of the day before making our way to St. Peter’s Square for the tram to the Etihad. That’s where we came across the anti-Brexiteers. I’m not particularly politically motivated but I do have my views on this. I’m also of the opinion that Theresa May is probably the best woman Prime Minister we’ve ever had although I’m not sure that’s a contest. I did once join a demonstration back in my university days when the Minister of Education turned up in Sheffield and we felt duty bound to abuse her. Margaret Thatcher was her name; as I said, the current incumbent is probably the best woman Prime Minister we’ve ever had. It was a peaceful demonstration, no sign of any problems at all and there were a nice selection of banners with some interesting slogans. The one that caught my eye simply read IKEA HAVE BETTER CABINETS. I thought boarding a tram would give us a better chance of a seat. How wrong was that idea? We just about got enough space to put our feet so packed was it. Thankfully it is not many stops to the stadium where it was a relief to get off. The teams, by then had been announced. City, to my relief, had left out the wonderful David Silva. Sergio Agüero was going to be sat with him too as was Raheem Sterling. But they did name a few decent players in their starting eleven. I’ll start with Kevin de Bruyne and most of the others are names that roll off the tongue. Our team showed just one change from that which had beaten Barnsley in the previous round with Robbie Brady, clear of suspension, coming in for Sam Vokes. But it was a strange looking line up and I don’t think many could have predicted the formation, the club certainly didn’t on announcing it. One Burnley fan, making his way up the stairs to the Gods (third tier), said about it: “It’s more jumbled than a jumble sale” as he, like the rest of us tried to work out just who would be playing where. Stairs? With my knees? Thankfully there was a lift to take me up. It’s my first time up there in the upper tier, the most recent addition to the stadium. It’s nothing like as high as Newcastle thankfully and I thought the view, from my seat about ten rows back, was fine. As for the team. Kevin Long, James Tarkowski and Ben Gibson were the three central defenders in front of Nick Pope with Charlie Taylor (on the right) and Stephen Ward in the full back positions. The midfield was Brady, Jeff Hendrick, Steven Defour and Dwight McNeil while the forward position was given to Matěj Vydra. It would be very easy now to write how we were hammered, how bad we were and how much better we should have done, and there are elements of all these things. However, the quality of this City team has to be taken into account when reviewing the game. To put things into perspective, back at the start of the month they beat Liverpool 2-1 at home with Roberto Firmino scoring Liverpool’s goal. Since conceding that goal they have now, including yesterday’s nap hand, scored a grand total of 29 goals without conceding. I know 17 of them have come against Rotherham and Burton but that is still some going for any team at any level. We did have a couple of early opportunities but undoubtedly we had a lot of defending to do in the first half and probably could be quite pleased to be only 1-0 down at the interval. Nick Pope had already earned his money when that goal went in midway through the first half. He might have done better, but there again so might both Long and Tarkowski as Gabriel Jesus skipped past them to score. The one major notable event other than the goal during the first half was an injury to the corner flag in our left defensive side. Kyle Walker managed to break it but you couldn’t believe how long it took them to find a replacement. Back in 1988, at a game between Carlisle and Burnley, the game kicked off with no corner flags. It was only spotted by World Cup referee George Courtney when he awarded the first corner. Courtney instructed Carlisle to put them in place but carried on while one bloke made it round the pitch with four flags. Here, Graham Scott, who had good game I have to say, held up proceedings for well over two minutes until someone finally appeared with a replacement much to the delight of the crowd. You sense that it might be over for us once City have gone in front but early in the second half we had the chance to draw level and what a chance it was. City don’t make too many bad mistakes but Nicolas Otamendi did here, gifting the ball to Vydra. Was it overconfidence from the striker? I don’t know, but having been left with only Ederson to beat he tried to bend his shot round him and into the corner only for it to just miss the target. There is absolutely no doubt; he should have scored. We paid for it, as you would expect. Just a few minutes later City doubled their lead through Bernardo Silva, a deflected shot that Pope probably should have dealt better with, and that, as you say, was that. It was following the same pattern as the league game and now it was a matter of keeping the score down. We might have been quicker to close down the brilliant De Bruyne but there was precious little we could have done to stop the shot from the clear man of the match when he made it 3-0. Pep must have been getting concerned so he sent on David Silva and not much later they got number four, an unfortunate own goal from Long and then, just four good measure, Agüero appeared. He got number five from the penalty spot after a farcical foul by Long. There is no doubt that Pope was partially to blame, setting off to come for it and then stopping, but quite what Long was doing I’m not sure but there was absolutely no doubt he all but manhandled David Silva for Agüero to get his customary goal against us. That was it, the pain was over and it is painful. After the defeat in the league, one of my friends said he wouldn’t be going there again. “It’s no fun watching us get hammered like that,” he said. He’s right, it isn’t easy to watch even when you know just how good City are and it doesn’t help when we are using the match to give players some minutes on the pitch and playing with players out of position in a strange looking line up. Embed from Getty ImagesAnyway, never mind, we’ve only to play them once more this season. If we thought that was the worst of it over with we had another think coming. It was nothing like as bad as it was after the league game there last season but the rain was pouring as we came out and my coat had hardly dried out this morning. Still, we got to Piccadilly in good time and over to Chorlton Street for the X43. He didn’t take the correct route, the bus got stuck in a traffic jam of all traffic jams in the city centre. Add to that the hold ups on the M66 and it took us not far short of two hours to get back. Never mind, we’ve only got to go back to Manchester again on Tuesday. I might call at IKEA first and have a look at their cabinets. I might hold a referendum on the message board to see whether people think they are of good quality. Manchester City: Ederson, Kyle Walker, John Stones, Nicolas Otamendi, Danilo, Kevin de Bruyne (Phil Foden 75), Fernandinho (David Silva 66), Ilkay Gündogan, Bernardo Silva, Gabriel Jesus (Sergio Agüero 75), Riyad Mahrez. Subs not used: Arijanet Muric, Aymeric Laporte, Leroy Sané, Raheem Sterling. Burnley: Nick Pope, Charlie Taylor, Kevin Long, James Tarkowski, Ben Gibson, Stephen Ward, Robbie Brady (Jack Cork ht), Jeff Hendrick, Steven Defour (Ashley Westwood 77), Dwight McNeil, Matěj Vydra (Chris Wood 62). Subs not used: Joe Hart, Ben Mee, Ashley Barnes, Sam Vokes.